Who doesn't enjoy a seaside vacation! The surf, the sand and the ice creams. 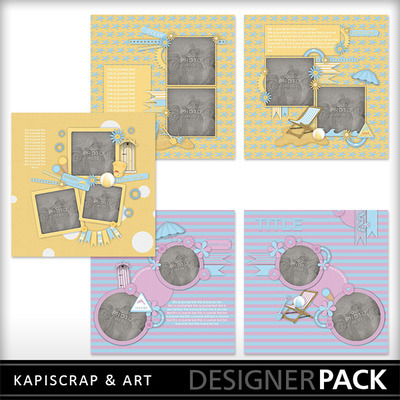 This set of templates is an ideal way to preserve those wonderful memories. Your whole family can enjoy looking at these over and over. You will enjoy both the quality and the accuracy of each template as all items and shadows have been placed with precision. Simply place those “must scrap” photos and edit text to get beautiful and high quality layouts in just a few mouse clicks; perfect for those who want to scrap, but have too little time! This album is designed for a 12 x 12inch page, but can be changed to 8 x 8 inch very simply without any loss of quality or movement of elements. This set of templates has been made by CT member Saviscrap.